Got a bag frozen corn that’s been sitting in your freezer and don’t know what to do with it? 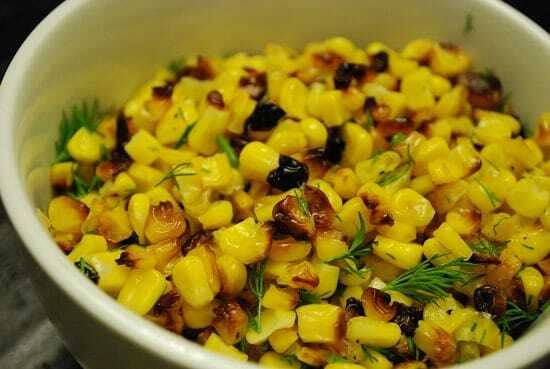 Try this easy, yet savory Roasted Corn Recipe with Dill. The tangy lemon and dill contrast the sweet corn and butter perfectly, making a deliciously unique side dish that adds some pizazz to standard corn kernels. Each satisfying serving is just 4 Points, and it looks so pretty on a plate next to some grilled chicken or fish. I love taking this roasted corn to potlucks or BBQ’s because it’s such a different way to serve corn, and everyone always enjoys it. Ah, how I wish that corn was 0 Points…I’d be chowing down on this everyday! A tasty and different way to prepare corn, this Roasted Corn Recipe with Dill is delicious and easy. Just a few simple steps, and you’ve got a lovely side dish recipe for just 4 Points per serving. Set a non-stick skillet over medium high heat. Spray skillet with non-fat cooking spray and add in the corn. After a couple minutes, you can stir, gently, once, wait a couple minutes and then stir gently again. Continue gently stirring every couple minutes until corn is roasted, about 8-10 minutes. Add in remaining ingredients and heat, while stirring gently, until butter is melted. Just made this dinner tonight and it was amazing! Didn’t have any light butter or fresh dill so I used dried dill and regular butter, but it still turned out tasty! And I agree, if only corn was no points, haha. This sounds delicious…looking forward to trying it! I have just discovered the “wonders” of roasting vegetables so I am anxious to try a recipe with corn. I am not a huge vegetable lover but these recipes have made me a believer…thanks!